Trolleys This Way sign showing a green arrow pointing to the left, on a white oblong sign, close to the ground on which is written "TROLLEYS THIS WAY" in green coloured capital letters. on a Golf Course. The picture is portrait, close-up and low to the ground showing individual blades of grass and is set against a light deciduous woodland background and deep azure blue sky. 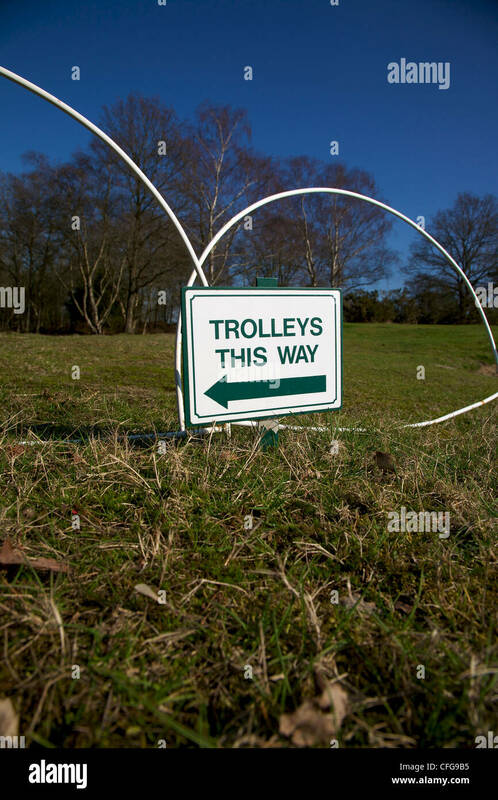 Immediately behind the sign are two white metal hoops designed to keep golf trolleys from venturing further onto the putting green.